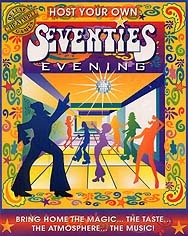 Transport yourself back to the 1970's... the age of bad taste, huge hair, colossal collars and flowered flares! Dust down the lava lamp, plump up the bean bags, pull on your platforms, adjust your chest medallion and... boogey! You're in for a night to remember!!! Audio CD with songs from the original artist: I Will Survive; Bye Bye Baby; Young Hearts Run Free; Tiger Feet plus Love's Gotta Hold on Me and When Will I See You Again all toppin' hits! CD quiz games: Topical Trivia; Name The Year; Memory Games & Activity Games. Host's guide with an introduction to the culture and background of this crazy decade plus helpful tip to turn your house into a discotheque! Groovy Recipes, fab food and hip-gyrating drinks from the era of undiluted kitsch. Invitations to pack the house with a bunch of cool dudes, crazy mamas and glam rockers. Name Tags to help you recognise Bjorn from Benny; Anni-Frid from Agnetha! PLUS 'Pin the medallion on the medallion-man! All that you need to enjoy the magic of the '70s without using a time machine!